The majority of law enforcement officers are killed in confrontations that take place at under seven feet. The only answer given for how to win in these situations is "just shoot 'em." If it's that easy, why do officers keep getting killed? What we need is a fighting system that allows the defender to instantly and reflexively employ either deadly or non-deadly force while minimizing the assailant's ability to harm them. InSights Training Center Instructors have taken their practical individual experience and together developed a system that works. The problem with most systems is that there are too many decisions to make in too small a time period. It would be like carrying five guns of different types, shooting them all differently, and trying to choose which one to use under the stress of combat. The saying goes, "Beware of the man with one gun." Well, we say BEWARE OF THE INDIVIDUAL WITH ONE COMBAT SYSTEM! - the person who knows without hesitation exactly what he is going to do in any armed or unarmed conflict. In this course you will become such a person. 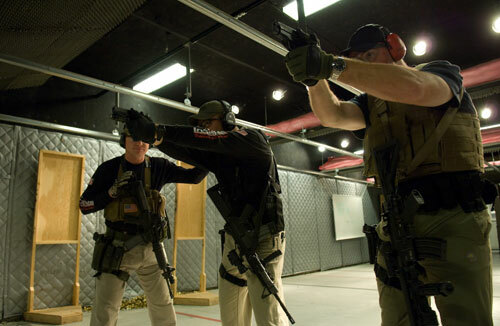 You will learn a full unarmed combat system and an integrated firearms combat system. The course can be physically demanding depending on how hard you try, but everyone should come regardless of age or physical condition. You will only be asked to do what you can. The course will make extensive use of striking bags and protective padded suits (FIST gear) and you will be striking "opponents" with everything you have in combat simulations. Reliable functional handgun; Belt holster (rigid) with sturdy belt; 500 rounds,3 magazines or speed loaders; Flashlight (SureFire type preferred); Hearing and eye protection; Mouth guard & cup; Concealment garment (expendable); Notebook and pen; Soft elbow and knee pads. In today's low-availability/high-priced ammo climate we'll be using SIRT guns and other training options to help keep the round-count down while maximizing the benefit.